This custom built tank will house turtles inside the nature center. The mural art on the front was created by using pictures from the woods and creeks just outside the center. A large terrarium will be home to the live Common and Alligator Snapping Turtles. The wall above and below this terrarium will be a mural depicting a rocky river bank with the 3-D cliff extension on the right blending into the scene. The upper part of the mural will be made from “frosted glass,” illuminated by exterior light from the opposite side to represent sky on an overcast day. Just as in an actual landscape, the sky will be interrupted with the vertical opaque images of tree trunks. 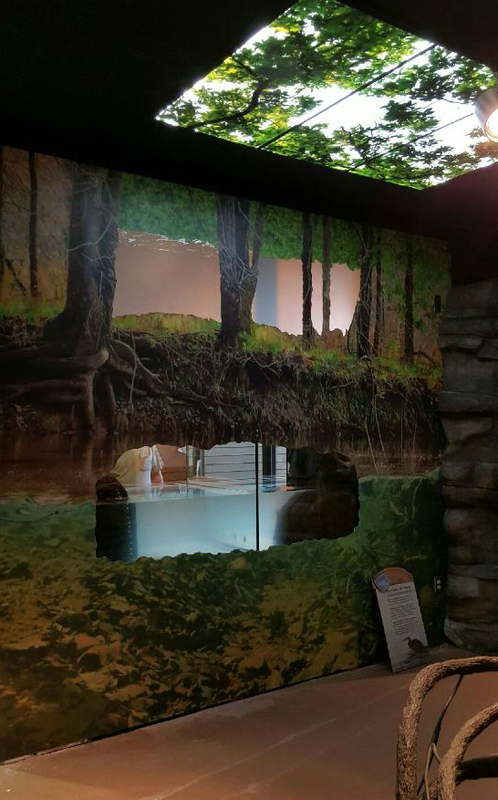 Below the upper bank in the mural, tree roots cascade to the river below, which is represented in the mural by an irregular window opening into the turtle aquarium behind.